Submit Response is a weblog by Jack Mottram, a journalist who lives in Glasgow, Scotland. There are 1308 posts in the archives. You can subscribe to a feed. This post was made on and belongs in the music, photographs category. The previous post was Hemmed In By God, and the next post is Luke Fowler On The Beck’s Shortlist. 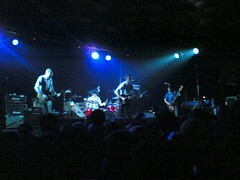 Uncle John & Whitelock At The Barrowlands! Best band in Scotland (hell, the UK, probably), on the premier stage in the land. They were bloody good too, as per usual - if you happen to be in Blackpool tonight, or Sheffield tomorrow, you can catch them on tour with celebrity smackhead combo Babyshambles (who I didn’t bother to stay for, sated as I was by the mighty Whitelock sound). Posted at 4pm on 15/12/04 by Jack Mottram to the music, photographs category. After seeing uncle John and Whitelock at King Tuts last night, Jack, I can’t do anything more than agree with you. Just scored a copy of “there is nothing else” & right about now there may well not be. totally gripped, gutturally shaken & intrinsically stirred. powerful stuff of the highest order.